This desert parasite is relatively rare (the yellow C. tubulosa is commoner, look at my previous pics). I always thought that this species occurs is salty locations, but found it this time is a sandy area near Nizzana on the Israel-Egypt border. 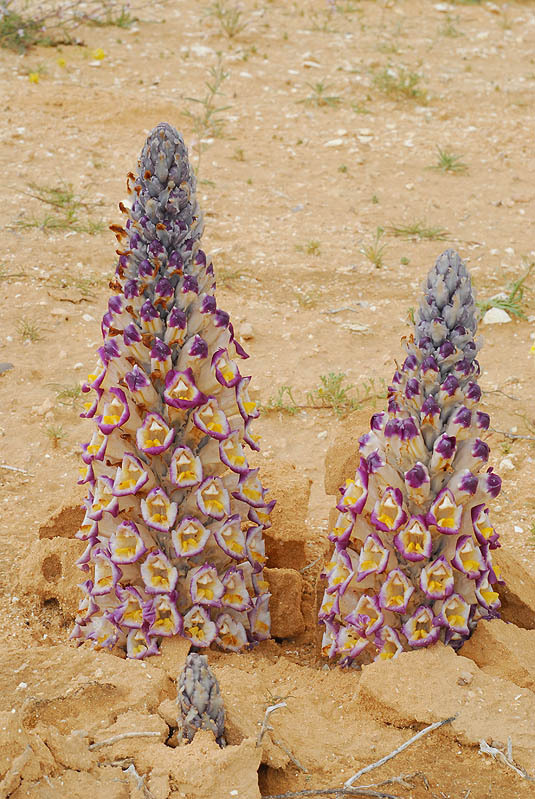 Its robust inflorescences are in complete contrast to this arid place. A good picture of thie very unusual plant. Good colour and focus. Well done. Great shot - I especially like it because I saw a lot of these - or similar - in Morocco last week. I was not sure what they were exactly. Fine capture showing this beautiful flower growing out of what looks like very harsh conditions, thanks for sharing. A great composition of this rare and interesting species, thanks to teach it. Another wonder from the world of plants!!! These ones are very big and tall - must be for the rains you had this year. Very abnormal flower, ....interesting. Strange beauty. Very good photo. Bravo. Best regards, Cezar T.
Beautiful parasite and very strong: it has broken sand to rise! Great details and beautiful light. Extremely interesting! Thank you very much for showing us these unusual and rare plants. Ton image replace cette esp�ce fascinante dans son milieu. Le paysage est d�sertique et on se demande quelles racines cette plante arrive � trouver pour se d�velopper. Impresionante y muy bonita. Aqu� hay especies similares pero de forma m�s cil�ndrica. Belleza.